The United States today exists in an increasingly unstable, multipolar world of competing states. Since the start of the Global War on Terror in 2001, the United States abandoned larger strategic concerns to mollify the scourge of Islamic extremism effectively. However important this fight may have been and may continue to be, the fact remains it also distracted us while opening a strategic opportunity that America’s rivals, including China and Russia, have been more than happy to exploit. Today, China’s nuclear arsenal is expanding at breakneck speed and Russia’s nuclear force is entirely modernized, posing a serious threat to the United States and its allies. A recent study by Globsec, a Slovakia-based NGO affiliated with NATO, concluded that if the United States and Russia ever went to war, the Russians would not only use nuclear arms in a limited fashion, they also would likely defeat the United States in such a conflict. Focusing too much on matching a rival’s nuclear arsenal could also prevent the United States from pursuing a much more vital mission: improving domestic tranquility by expanding our economy. Further, a missile build-up would all but ensure the start of a new Cold War. Given the multipolar world America exists in today, nuclear deterrence based on mutual assured destruction will not work in the same way that it did in the past. Today, deterrence requires methods much less straightforward, if only because the number of nuclear actors has increased to such levels that real “balance” is impossible. Also, a country that possesses even a handful of nuclear weapons inherently will possess outsized influence on the world stage. In that context, it is almost irrelevant how many nuclear weapons the United States has at its disposal (or how advanced they are). Rogue states like North Korea don’t have to pose an existential threat to the United States with hundreds or thousands of warheads. A handful of rudimentary nuclear weapons is threat enough. Pyongyang can threaten us on the cheap much the same as a rival power like Russia can with an advanced arsenal. The only solution to these kinds threats, then, is to look at what President Reagan did to combat the Soviet nuclear threat. Reagan fundamentally believed that nuclear weapons needed to be abolished and that the Soviet Union was the paragon of evil at the time. He was right on both counts. Obviously, eliminating nuclear arms in the face of the Soviet threat was a nonstarter. So Reagan set about expanding America’s nuclear arsenal (and the military overall); loudly denouncing the Soviet Union; covertly supporting anti-Communist movements throughout the world; and insisting that the world would be better when Communism was dead. Yet Reagan couldn’t shake his conviction that nuclear weapons were the most terrible things devised by man. In his first term, Reagan realized that the United States could render nuclear arms obsolete while waging a (winnable) Cold War against the Soviets. He sought to deploy a space-based missile defense system—dubbed “Star Wars” by its opponents—to protect America and its allies against the threat of Soviet nukes. 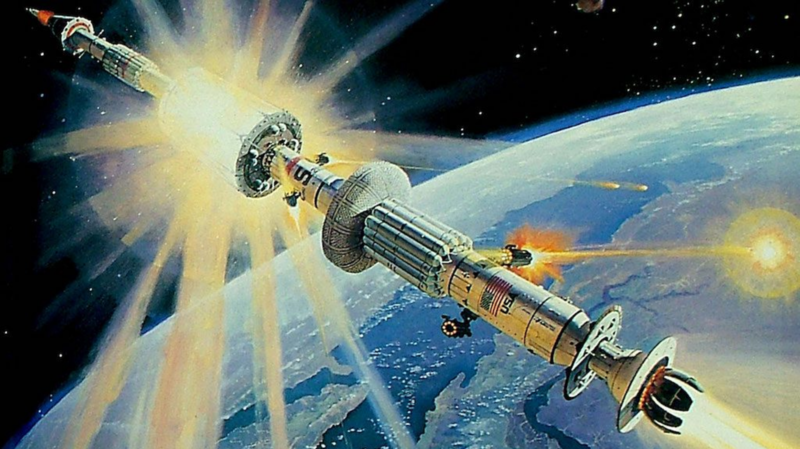 With such a system in orbit, the Soviet nuclear risk would have been erased, and the need for nuclear arms would have been removed, with no actual war required. Back in the 1980s, numerous technological barriers stood in the way of deploying a credible space-based missile defense. Today, however, the United States has the technological, financial, and strategic abilities to build and launch such defensive systems. Nuclear weapons have been with the world since the 1940s. Nuclear weapons are relatively easy to develop today. A backward state like North Korea can easily build a reliable nuclear arsenal, just as the Chinese can. So, the idea of resting America’s ultimate defense on these powerful-but-outdated weapons is bizarre. No matter how many nuclear weapons the United States could build in a short time, or how modern the United States could make its aging force, little could repair the damage that 30 years of post-Cold War cuts and political neglect have imposed on America’s nuclear force. Not in a timely fashion, anyway. Besides, U.S. leaders have never been comfortable with the destructive effects of nuclear weapons. In many respects, nuclear weapons are more trouble than they’re worth. Unilaterally abandoning nuclear weapons would be folly, as that would open America to attack. It is in the strategic domain of space where the United States can still deter its adversaries without relying (at least exclusively) on its nuclear arsenal. Reagan understood this. As President Trump faces down rogue states such as Iran and North Korea—not to mention rivals Russia and China—he will need fundamentally to upend our enemies’ strategic calculations. By placing a reliable missile defense system in orbit; by potentially placing non-nuclear offensive weapons in orbit, American deterrence would be assured, and our competitors would be put on their heels. A missile defense system in space would neuter the threat that nuclear weapons pose, and offensive strategic weapons in orbit would hold our rivals hostage, in much the same way that nuclear weapons held the world hostage in the Cold War—minus the risks to our people. CLICK HERE to continue reading at American Greatness!